Finding a new rheumatologist can be stressful for patients because they may be concerned they may not be left without a doctor in the meantime, and unable to obtain needed medications or help for any crisis situation that could arise. For people with rheumatic diseases like rheumatoid arthritis (RA) / rheumatoid disease (RD), a good rheumatologist is a lifeline to improved function (getting one’s life back) and possibly extending one’s life. Asks questions, listens for answers. Makes eye contact. Shakes hands gently. Education is recent or up to date. Attending American College of Rheumatology (ACR) meetings every year or so is a good sign. Encourages patients to become informed and educated about their diagnosis. Welcomes friend or family member as an appointment companion. Views you as the manager of your treatment plan, seeing you as a partner. Use a wide radius: be willing to drive an hour or two. Try to use a university or teaching hospital. The doctor will be more up to date on current studies and treatment. Search doctor rating websites for lemons and gems. Try sites like angieslist.com, RateMDs, Vitals, Healthgrades, and Google reviews. Use the phonebook to call rheumatology offices, asking pertinent questions. Cross check credentials, education, or pertinent questions online. Try Google, Facebook, LinkedIn. Obtain all records and make copies for the new doc’s office. Offer to pre-send your records if the doctor prefers. Fill out as much paperwork as possible ahead of time and try to arrive early. Type up a summary of past and current RA-related issues and treatments. Include lists of current medications and all past RA-related medicines. Be appreciative, cheerful, and polite when possible. Try to make friends with the staff. Bring someone with you to help understand & remember what was said. Listen to the doctor’s opinions, even taking notes. Ask pertinent questions. Do not go back if you are treated disrespectfully. Tell them why you cannot come back. Edit: Updated images and links 3/29/17. The university/teaching hospital tip needs to be stressed again. My first rheumy was not affiliated with a teaching hospital but my new one is. The difference is absolutely incredible, my new rheumy is up on all the latest treatments and is willing to sit down and take the time to explain them to me. She’s also up on the latest tests, such as ultrasound. My X-rays aren’t showing joint damage, but she ordered an ultrasound of my fingers and toes and the damage was clear as day. I’m not even sure if my first rheumy was aware they could do joint ultrasounds!!! It certainly was never mentioned in more than a year of visits with her. I have to drive a little further for this doctor but it’s worth every extra mile! I’m a rheumatologist and I started a blog only 1.5 weeks ago to try and address the discrepancies between patient & doctor’s expectations, the poor awareness of rheumatic conditions, as well as the growing need for doctors (including rheumatologists of course) to participate in social media. I stumbled across your blog and would agree with the points you list. As a rheumatologist, its much better for me if my patient is informed, inquisitive and interested in their own condition as we are going to be starting a long term relationship. Congratulations on a new blog. I agree informed patients should allow for better communication and more effective treatment. Thanks Kelly. I’ve directed a number of my RA patients to your site. Support from other people living with RA is very useful. I’ve been diagnosed since October 2010. I have already changed rheumatologists. The dr. I have been seeing is affiliated with a university/teaching hospital. She never makes eye contact, never shakes hands at all let alone gently, talks to her computer screen and doesn’t offer much information…I have to keep asking questions to get to the next step. She tells me only what she want to and that’s not good enough for me. The staff is rude. Therefore I have changed rheumatologists. The dr. I am now seeing fits all of your 21 tips. The one tip that stuck out to me was the one saying that a rheumatologist should welcome the accompanying friend or family member warmly. My new dr. did exactly that for my husband who accompanied me to the first visit. He is sending me for x-rays of the hands, wrists, and feet. He says that this should have been done at my first visit with the previous dr. He also says that my rheumatoid arthritis is pretty severe and the present treatment was not aggressive enough. I left the office with an inspirational feeling…something I have not had in quite a while. I am so glad I sought out a second opinion! I am so glad you went to find another doctor & it sounds like you are getting better care! This is so much harder than people realize especially when we have to do it more than once. But you really need this care! Thanks so much for putting your experience here to encourage others! An immunologist who knows about both conditions might be able, but I think that most MS patients need a neurologist and RA patients see a rheumatologist (for joints). Since RA (and MS) can affect many systems of the body, there’s no perfect specialist for either – and especially not for both. I feel for you. I find this article not very informative for people who have not yet been diagnosed with RA, but know they have it. I need to know what to expect. Hi Velva, that it not the topic of this post. There are many pages on this site which could be used for the purpose that you request. There are almost 550 pages here so you might want to use the search function or one of the other organizational tools such as the Tags List. There’s a tab on the menu for inquiring about diagnosis and an RA Map on the menu created for new RA patients. I’ll try to post a link for you as soon as I can. When I go to a new doctor, should I take the x-rays from the old doctor. Do you think that blood work should be checked more than one time. My blood tests did not show any sign of RA. Polly, carrying around your films is a good idea or a digital version if you have it. I can’t answer about the blood labs since I don’t know which ones. I do know that some of the numbers can vary by laboratory or can go up or down more quickly than they are often tested. For example, the CRP can change in a matter of hours but is sometimes tested every 2 yrs. If you are looking for RA from a blood test, you should ask about your anti-CCP test. RA cannot be diagnosed by only a blood test since there are patients with negative blood tests even after years of RA with evidence of damage. You might want to read through some posts on diagnosis of RA, too. Click here for whole list. Does any one know of a rheumatologist in Manhattan, NY who has RA ? My reumatologist has retired recently and a much younger dr. has taken over his practice in the hospital. I am very upset after two visits with him. I was diagnosed in 2004 with RA and Sjogrens Syndrome and have been granted Social Security Disability as of last year. The new REUMY thinks i have neither, although i have positive blood tests for Ra. But i do not always show a positive EST or CRP. He never listens to my concearns and argues that the blood tests do not confirm my joint pain! Now he says i have hip bursitis and fibromaylgia. I need to find a reumy who listens to me. Help!! Good REUMYS are hard to find!!! They are, but they are out there so don’t give up!! Eventually you’ll find a another good one like you had. We are putting together a list of good drs that may eventually be helpful with that. You can also look through the comments on this page https://www.rawarrior.com/santa-bring-her-a-rheumatologist-please/ to see if there is any dr near you listed. 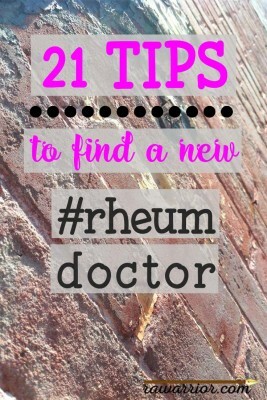 What is an acceptable amount of time to wait to get into see a new Rheumatologist? My family doc ran blood tests and referred me to the only Rhuemetology group in town two weeks ago (I live in a small town) and my appointment is not until early November. I’ve had symptoms since June and I am very anxious about the RA diagnosis and waiting two more months to start treatment. Any words of advice? Thank you so much for your blog. I need this information-so very helpful during this scary time. Hi Kelly. I love your blog. The post about the “Doc Space Heater” was right on. But I have to disagree about the advice about going on AngiesList, Yelp, and physician rating sites. These are not companies that are in the business of providing public service. These are companies that reward complaints and blackmailing while at the same time they put up advertisements of their paying clients to be displayed against the negative reputations. A lot of the sites, especially Yelp, manipulate patient reviews so that the advertisements are even more successful. Remember, the purpose of physician ratings sites is to create controversy and business around bad reputations. Not good ones. Furthermore, would three or four reviews from the past five years of a Rheumatologist be indicative of the few thousand patients he sees every year? The entire business of patient reviews is extremely flawed. It seems only Google+ is making an effort in making ratings fair by not allowing for anonymous reviews. I hope other ratings sites come to be. But I hope you update your advice to exclude physician ratings sites for the time being. I’m new to RA and new to RA Warrior, but have read many of your posts in the past few weeks. 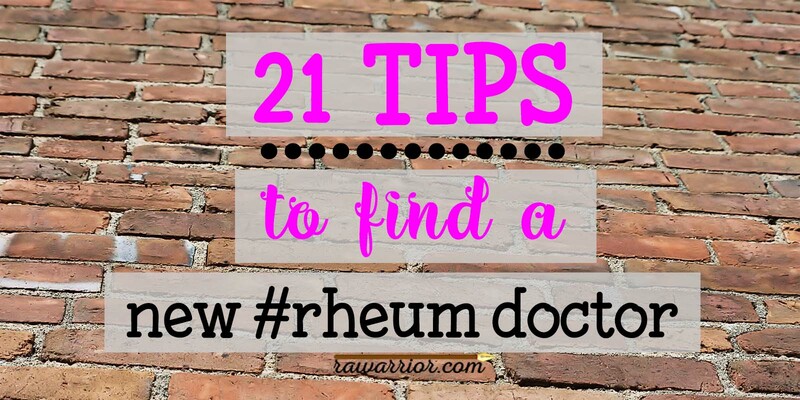 These resources are what actually encouraged me to seek a new rheumatologist. My previous doc never seemed to listen or explain. He just threw meds at me instead of working with me to set goals and make a plan. But after reading RA Warrior and talking it out with my boyfriend, I decided to make a change. Today I had my first appointment with a new doctor. This doc is at Hospital for Special Surgery in Manhattan and is AMAZING. Everyone at HSS was kind, polite and understanding. I actually can’t wait for my next appointment. I know it’s not super convenient in terms of location, but if any readers reside in the Tri-State area, I recommend making an appointment. With a recent diagnosis of RA, I still have a ton of questions. The doctor I am seeing instilled a great deal of confidence when she answered a question by saying “this is part science and part art. We need to work together to ensure that we are treating you in the best possible way.” My doctor is my partner in navigating this road – find someone who you feel you can call your “partner”. Thanks for sharing that AWESOME example Rochelle. We all need a partner like that. That’s what we are working toward. “Try to use a university or teaching hospital. The doctor will be more up to date on current studies and treatment.” This is not factual! I was asked to be part of the volunteer faculty at a University program to teach the fellows about RA! They do not see nearly as many patients there as I do!! Could you please tell me where to find your list of competent rheumatologists? The article brings up a great suggestion about making sure that you schedule an appointment with the new rheumatologist once you’ve chosen one. You don’t have to commit to that rheumatologist being your doctor, but you at least want to sit down for an initial consultation. After all, they deserve a chance to look at the condition of your arthritis and suggest a treatment plan before you decide whether or not to continue seeing them.